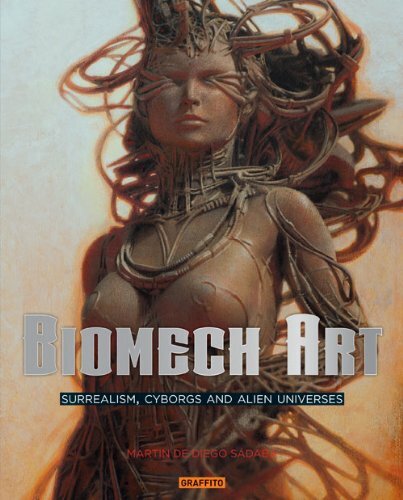 Biomech Art is an impressive collection of artworks whose theme is a mixture of surrealism, cyberpunk, alien landscapes and dystopia worlds. It's quite a thick hardcover book at 256 pages. Author Martin de Diego Sadaba has curated the works of 28 artists from USA, Europe and Japan for the book. Just look at the cover and you can see that wires are going into the eyes of the character, and her arm actually morphs into wires below the elbow. That's just a teaser for what's inside the book. Some other examples include the Pascal Blanche' 3D art with psychedelic colours, Christopher Conte's steampunk creations, many paintings involving alien-like warped beings, Peter Gric has some wonderful pieces of human-like characters fused into the environment, a few H. R. Giger inspired pieces, scenes from the underworld, transhuman creations, oh and a floating head fused with teddy bears by the skin, and more. Many pieces are quite difficult to describe even. Great book for those into the dark arts. There are lots of disturbingly good and good disturbing stuff to see.